Posted on Mon 12 Aug 2013 at 1:13 AM PST. Filed under Recipes. This is the Greek version of pork belly, as we prepare it in the Epirus department of Greece. I consider it a more Paleo and healthier alternative to bacon (which is actually processed). My French husband loves it too! 1. Wash the pork belly. Using a sharp knife, remove the thick pork skin on the one side (if it was sold as such). 2. Cut the pork belly into 1 inch cubes. 3. 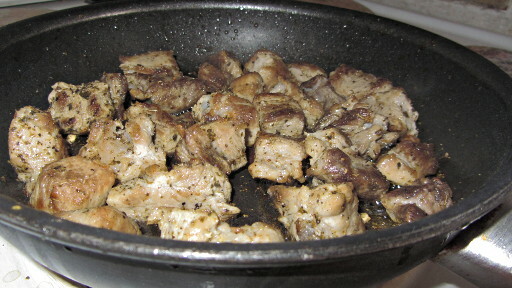 Heat the olive oil under medium heat, and add the pork cubes. Fry until cooked-through and golden brown, about 10 minutes. Stir a few times. 4. One minute before they’re ready, add the salt & pepper, oregano, and lemon juice. Stir. 5. Turn off the heat, remove the cubes to a plate (without taking much of the oil with you). Serve hot with fries (and tzatziki, if you do dairy).